Image courtesy Maria Baltazzi, Used By Permission. 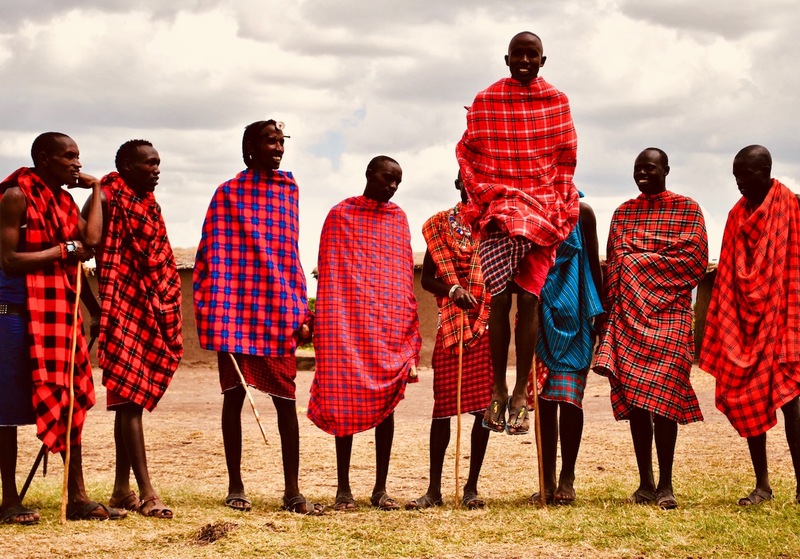 These are the phonetic sounds I hear as I watch a line form of Maasai Warriors, ages seventeen to twenty-five, all brightly robed, mostly in red. The Maasai is one of the world’s last great warrior cultures. More sounds explode from the Warriors. Now, the line leader calls out, the rest respond. Maasai Music. The only music ever heard comes from the Warriors’ voices. There are no instruments. Then something magical happens, they jump. Each Warrior takes a turn springing straight into the air, while the others sing. The Warriors jump high and long, hours long, keenly observing each other, seeing who catches the most air. The moment is both competitive and fun. They laugh, they chat and keep jumping. The non-Maasai call this the Jumping Dance. Its real name is Adumu and is one of the rituals the Warriors perform as they go from boyhood to manhood. Image courtesy Maira Baltazzi, Used By Permission. The Warriors’ jump is so joyous. A Maasai once told me that they jump because they are happy, which got me wondering why? What makes this group, who live in the sun-scorched lands of the Great Rift Valley in Southern Kenya and Northern Tanzania, happy? For one, the Warriors, especially the ones who jump the highest, get the best girls in the village. Some things are the same everywhere. Beyond that, they are happy because they live in harmony with nature and God. For the Maasai, there is one God, Engai, master of life and death, who dwells on earth and in heaven. And they pray, a lot. They pray during ceremonies. They pray during daily life. What about? Children and cattle. The family is super important to them. As for the cows, wealth in the Maasai community is defined by the number of cattle one owns; also is their primary sustenance. These Warriors believe that God gave them all, yes, all, the cattle on earth, and so feel called to protect them, along with their families from predators, and so go where the cows go. RELATED CONTENT: Don’t Wait for Happiness, Grab It Now! However, the most profound lesson learned from these Warriors is to be Happy with whatever you have. Personally, that means, being deep-seated in faith, loving your family, serving the community, feeling grateful and of course jumping when you are happy!